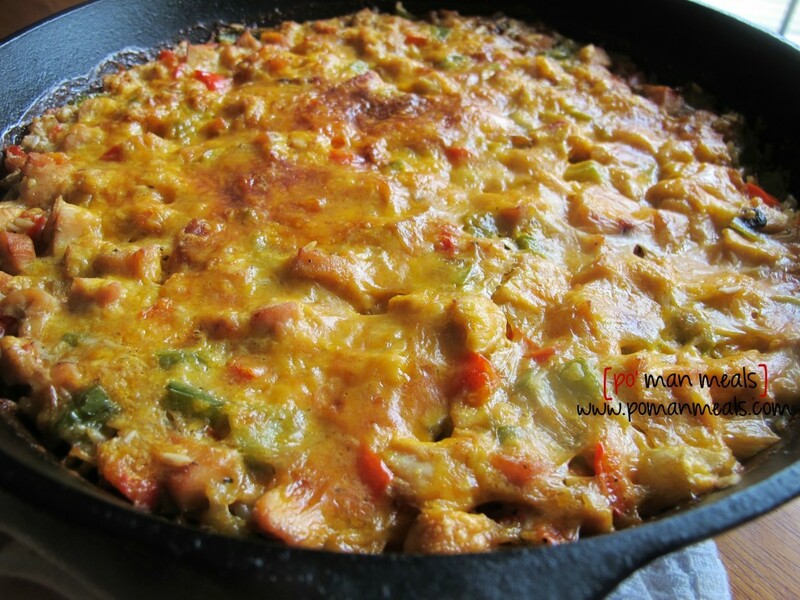 i know what you are thinking...'tijuana, you have went crazy with these skillet recipes!' you hit the nail on the head. i love heating up my gorgeous black shiny cast iron skillet, throwing in meat, fresh veggies and aromatics in it and tossing it straight in the oven. this time, i wanted a chicken and rice casserole. 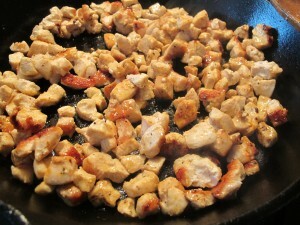 i wondered how it would turn out in the skillet. i definitely wanted to add in some creaminess but did not want to add a 'can of cream' anything. so, i spooned in some sour cream. it was delicious. the rice had the nerve to caramelize and crunch up a bit on the side of the pan... like some yummy crust. dee-lic-ous! preheat the oil in a large cast iron skillet over medium high heat. i used a 14 inch cast iron. like this one here. 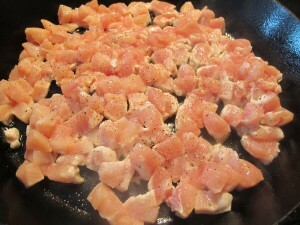 once hot, carefully add the diced chicken in a single layer. season with salt/pepper to taste. let the chicken caramelize by not moving the chicken for a few minutes. 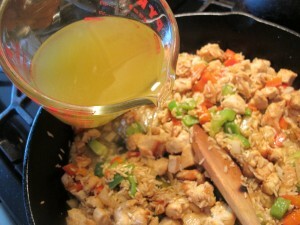 toss the chicken and allow to cook through. add in the red and green peppers, garlic, onion and thyme. season again with salt/pepper to taste and saute the veggies for a couple minutes. add in the rice. 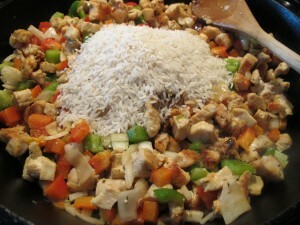 toss the rice with the chicken/veggie mixture for a few minutes. slowly stir in the broth, scraping the bits off the bottom of the pan. smooth the mixture into one layer and sprinkle the cheese evenly over the mixture as well. 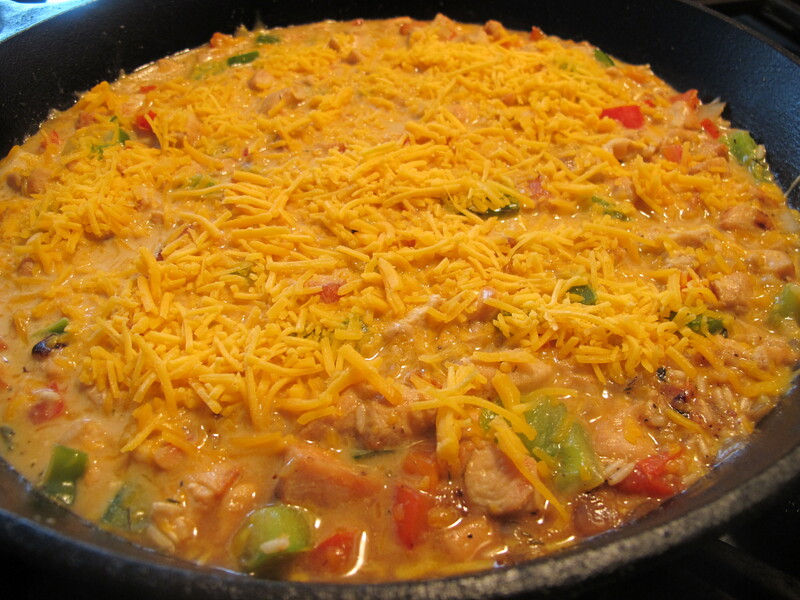 immediately place in the preheated oven for 30 minutes or until the cheese is browned and rice is cooked through. if you do not have a oven proof pan, transfer into a baking dish before you top with cheese. then top with cheese and place in the oven. spoon onto a plate and serve hot. I like to use brown rice, which of course takes longer to cook. Do you think I could sub that here? Would you suggest precooking the rice a little? Cooking it all the way and just putting it in the oven long enough to melt the flavors together? Or putting it in uncooked and baking in the oven a little longer? 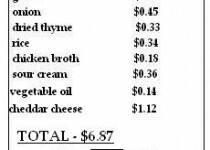 Your cost for the meal and ingredients list do not include cheese but cheese is included in the recipe name as well as the instructions! thank you for pointing that out, maggie! i have updated the recipe. Wow in the oven as we speak and house smells wonderful!!!! I have never seen a family go back for seconds and thirds and didn’t even have any left for my lunch today!!! I made a double batch too!! 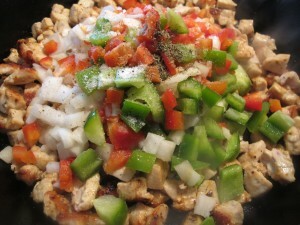 How long to toss chicken cook before adding peppers? Looks delicious. Can’t wait to make it! I made mine with Quinoa and it was fabulous! just soaked it first for 20 minutes and then cooked it like I did the rice … hubby was a HUGE fan!! I’m making it now and it smells so good. I’ll let you know how it comes out. I made this for dinner last night and it was truly delicious! I made this tonight and everyone in my family loved it. It was so quick to prepare too. I will surely make this again. Thank you! it was WONDERFUL that way too btw, one of these days I’ll try it with peppers =) thanks for the inspiration for supper! I have made this multiple times and it’s always a hit! 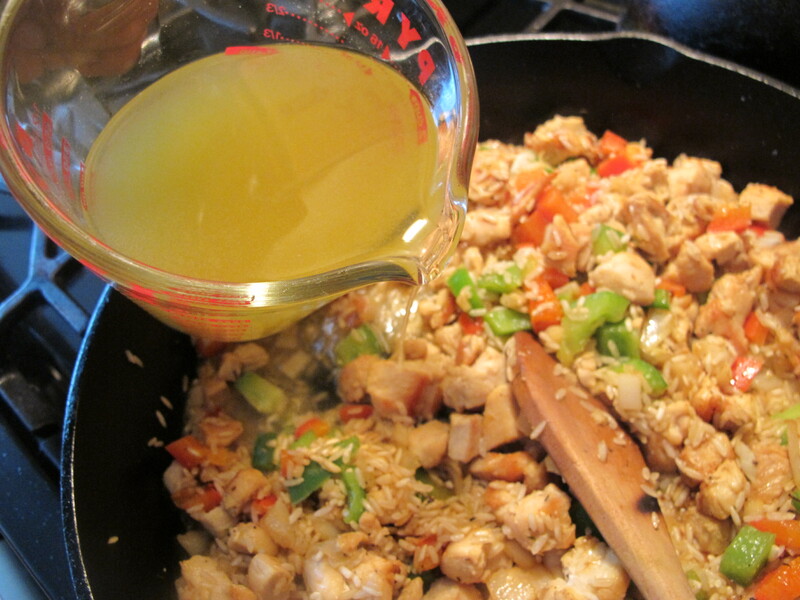 I usually use leftover chicken, and I do use a brown/wild rice mix, I just simmer it on the stovetop a bit longer and add a bit extra broth. I have made several of your recipes and they always turn out great. 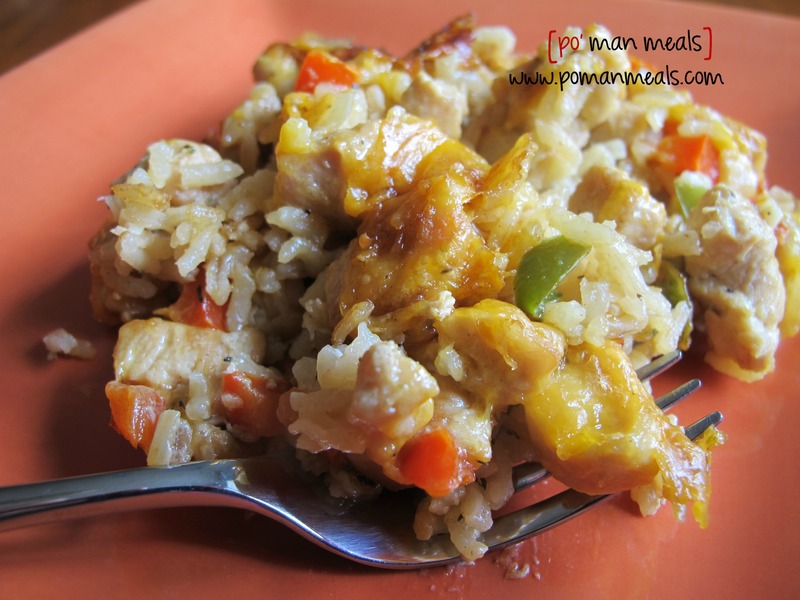 I especially like this one as most chicken/rice dishes use canned soup and my BF has Celiac Disease and cannot have those, so this is a keeper for him. hi janet! i am SO glad that you liked it! 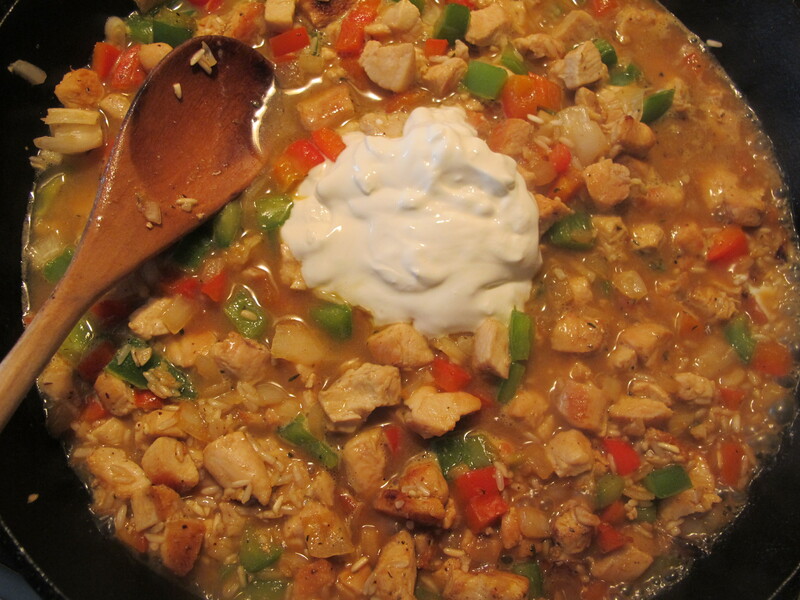 i am not a fan of condensed soup and try to leave it out of my recipes. anyway, i appreciate the feedback and for letting me know! Hey Niece, I made this one for dinner last night. Yummy and oh so easy! Uncle Jack went back for seconds! I’m trying my hand at a lemon-lime pound cake for Easter Sunday. I’ll let you know how it turns out. Luv ya! Sounds great. Green chiles, either from a can or better still fresh roasted would add another dimension. Or could go more even more Southwest with black beans, roasted corn, and chili powder. I made it tonight and it turned out exactly as shown. WAY too much for two people. I used yellow and orange peppers. Nice flavor, rice is moist and not sticky. I would probably do it again. It will make great lunches to take to work the rest of the week…. Thanks. Thanks so much for the recipes. I have made many of them and they are all really good. 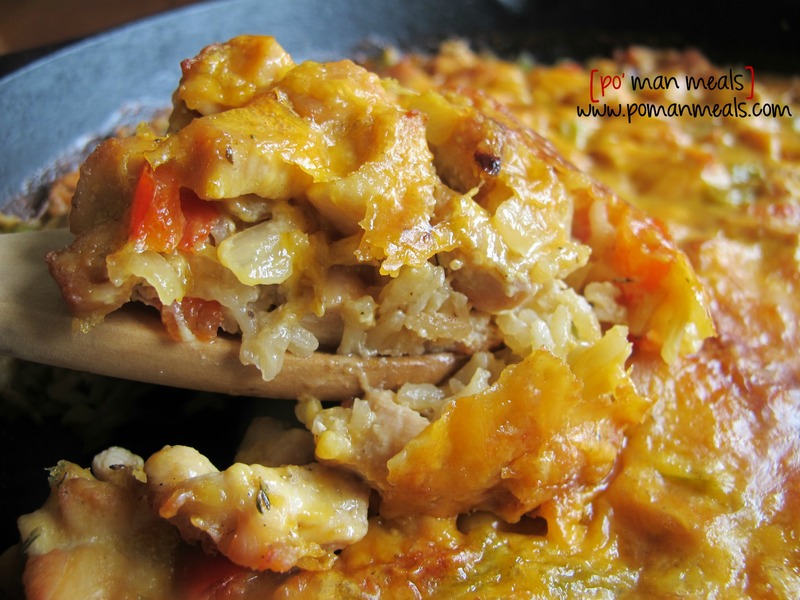 Last night I made the cheesy chicken rice casserole and we love it. There’s not one thing I would change in any of your recipes. We cook very much alike. Please keep the recipes coming! Oh! And the baked speghetti is outrageously yummy.